Flamethrower; hated, feared and used by all. 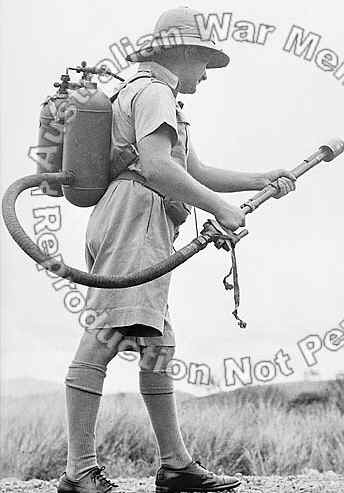 Possibly one of the most terrifying and demoralising infantry weapons ever produced is the portable flamethrower. As the introduction to the 1944 Australian Army training pamphlet for flamethrowers states: " ... flame has a powerful psychological effect in that humans instinctively withdraw from it, even when their morale is good. 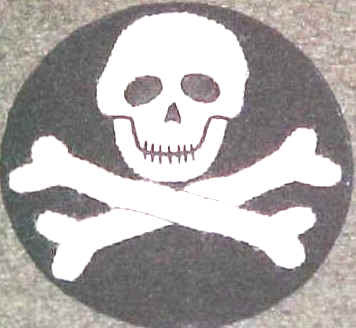 In addition, it is a casualty producing and lethal agent." Although first used by the German Army during WW1, the Australian Army's experience with flamethrowers really began during WW 2 when a need for this type of weapon was identified. Experience showed that a stubborn enemy, when well dug into extensive bunker systems, was extremely difficult and costly to dislodge using the more conventional small arms and grenades. 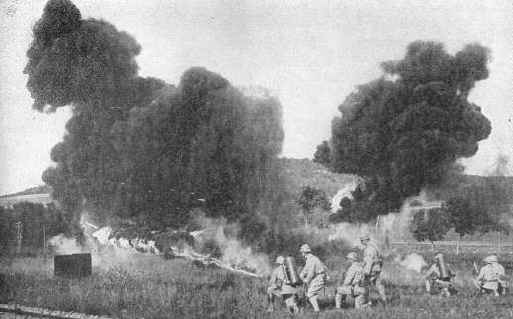 WW1 French troops using flamethrowers. Operational and experimental reports about the development and use of flame throwers were available to Australia from our Allies and demonstrated just how effective this weapon could be, particularly in clearing out enemy from fortifications with overhead cover. As a result, the Australian Army saw a requirement for two types of flamethrowers: a "man-pack" or portable model for the infantry and a larger "mechanised" model for mounting in armoured vehicles. However, the then standard US Army issue flamethrower, the M1A1, was not available in quantity so, in January 1944, design work on a local-pattern flamethrower was commenced. A pilot model, manufactured mainly by British Tube Mills (Australia) Pty Ltd, was completed by the following April. This was designated the Flamethrower, Portable, Ferret (Aust) Mark 1, the name Ferret being suggested because it would be used to ferret out enemy from bunkers. Badge worn by German flame-thrower troops in WW1. They were despised and were never taken prisoner. Despite encouraging results from the initial trials, development was slowed when it was learnt that sufficient quantities of American flamethrowers would become available shortly. Nevertheless, the Ferret was further developed, with Mk2 and MC (Improved) experimental models produced. Although never accepted into service with the Australian Army, the Ferret's fate was not finally sealed until early 1947, when a series of comparative tests against the American M2‑2 flamethrower were carried out by the School of Infantry. These tests showed that the performance of both types was near identical at optimum working pressure and that there was no advantage to be gained by adopting the local-pattern Ferret. The American man-pack flamethrower which initially became available about April 1944 which used compressed nitrogen as a propellant, compressed hydrogen an ignition gas and a battery–powered ignition system. All up, it weighed about 30kg (80 pounds) fully loaded. Only six are known to have been officially supplied before being super­seded by the improved M2-2 flamethrower. The M2-2 with an important local modification. was a type officially adopted for service with the Australian Army. The modification was the incorporation of a special non-return valve which prevented the expulsion of fuel under pressure in the case of a rupture disc failing. Spare pressure tanks were also manufactured in Australia, on the basis of six tanks per flamethrower. By early 1945, 162 M2-2 flamethrowers had been allocated to Australia under lend lease, allowing an issue of 36 per jungle division plus a reserve. These were supported by special truck-mounted, Rix Type K, three-stage air compressors which were allocated to each division to provide a supply of pressurised cylinders. Flame fuel was another item which was manufactured locally. Although most mechanised and man‑pack flamethrowers could be satisfactorily operated using diesel fuel, extensive experimentation showed that there was an optimum combination of operating pressure and thickness of fuel. 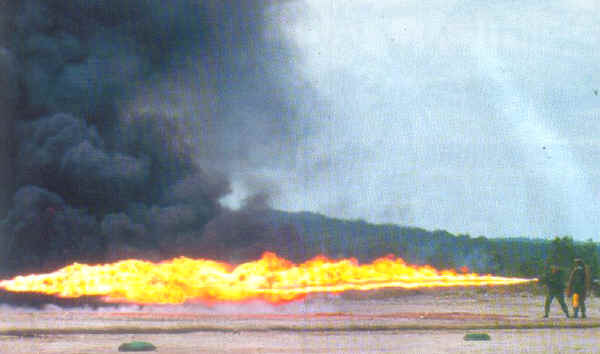 The optimum combination for a particular type of flamethrower was considered to be the one which gave the maximum range and most burning fuel onto the target. While variations to the working pressure were not such a problem finding the best fuel type took a considerable of experimental effort. The result was Geletrol which was formally accepted by the General Staff as fuel thickener in October 1944. It was made by combining various weights of the dried chemical compound Aluminium Oleate with petrol, diesel or a petrol‑diesel mix. The type of fuel used and the percentage mixture depended on the intended use. Although Aluminium Oleate had previously been used in relatively small quantities for the manufacture of specialised paints and greases, its use in flame warfare was entirely new. As a result, the sudden increase in demand stretched production facilities in Australia to the limit. Not only had the Army found a use for it in both man‑pack and mechanised flamethrowers but both the RAAF and the Royal Navy (operating in the Pacific) had also found it useful for making drop‑tank incendiary bombs. Local manufacture was carried out by two companies: Fletcher Chemical Company of Melbourne, and Robert Corbet Pty Ltd of Sydney. By early 1945, they were supplying specially scaled tropic proof packs of the light brown, granular chemical in either 20-pound tins for mechanised flamethrowers or 2-pound tins for man-pack flamethrowers. 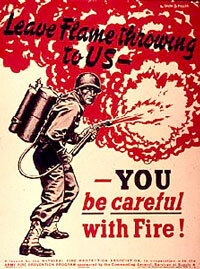 The man-pack flamethrower proved a very effective weapon, being used on many occasions in the later stages of the war. Just how effective can he illustrated by the actions on Tarakan of the flamethrower team from 2/48th Infantry Battalion who, on May 5, 1945, attacked a bunker from a range of about 10m. The flame went over the first bunker and into three well-camouflaged bunkers in the rear, from which the Japanese troops hastily withdrew without firing a shot! Approximately 14,000 M1A1s were produced, and the model was eventually replaced by the M2-2 Flamethrower. The M1A1 Flamethrower used thickened gasoline as a fuel, and required two men to operate; an operator to wield the flamethrower itself, and an assistant to open the fuel source valves and carry extra fuel, tools, and weapons for the both of them. Other battalions reported similar experiences. The 2/7th Australian Infantry Battalion Flamethrower Section, made up of 111 volunteers, was particularly successful during May 1945, when it used a pair of flamethrowers on several occasions to overcome well-fortified Japanese positions. Statements in the after-action reports sum up the attacks: "... patrol reported enemy were demoralized by flame.." and "... Japanese sentry was highly surprised .... ran back screaming!" Such encounters often resulted in large gains for very few casualties. <<< Papua, New Guinea. 1942-08. Flame throwers used by the Japanese against Australian troops at Milne Bay. Following the end of the war, the M2-2 remained on the inventory as the Australian Army's only man-pack flamethrower, although trials were carried out from time to time with equipment from other sources, including the British Lifebuoy-type flamethrower. The M2-2 was eventually modernised by upgrade or replacement, to M2A1 and M2A2 standard during, the 1950s. These remained in service until 1964, when a further upgrade to M2A1-7 standard took place. A U.S. flamethrower operator in Vietnam during Operation New Castle -- the weight and size of the fuel tanks made the soldier extremely vulnerable to enemy fire, and troops had to be assigned to protect him. 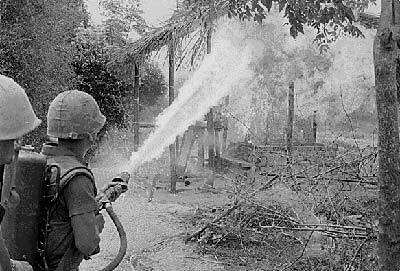 Man-pack flamethrowers were again used operationally by Australian troops on several occasions during the war in South Vietnam. 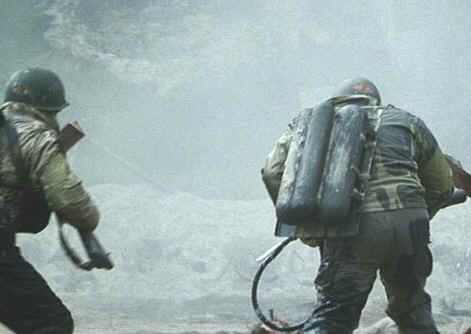 The fighting around Fire Support Bases Coral and Balmoral, for example, saw assault pioneers use flamethrowers to successfully subdue Viet Cong bunkers. Not only were they used on foot but on one occasion, from the rear deck of a Centurion Armoured Recovery Vehicle! Flame tanks of the 1st (US) Tank Battalion attack No-name Village, in the Quang Ngai province of Vietnam, during Operation Doser. 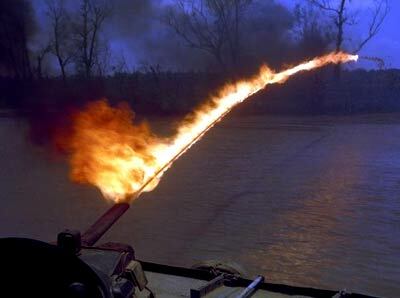 The M2A1-7 was the last man-pack flamethrower to be listed on the Australian Army's inventory. By late 1987, with local stocks of spare parts running low and additional parts no longer available from the United States, the type was declared obsolete. A few were retained on an official basis for museums such as the infantry and engineer museums but the majority were scrapped. Despite its demonstrated effectiveness and some rumours about purchasing the M2A9 version, there is apparently no intention at this time to re-introduce a man-pack flamethrower into the Australian Army. A U.S. Navy "Zippo" flamethrower is tested from a patrol boat. The unreliability of electronic ignition systems meant that operators sometimes had to use a Zippo lighter to ignite the fuel as it left the nozzle. In World War I, the German army rediscovered the flamethrower and added it to their arsenal (in a new and improved form). By World War II, forces on both sides used a range of flamethrower weapons on the battlefield. The most impressive innovation was the handheld flamethrower. This long, gun-type weapon has an attached fuel tank that soldiers can carry on their back. The backpack contains three cylinder tanks. The two outside tanks hold a flammable, oil-based liquid fuel, similar to the material used to make Greek fire. The tanks have screw-on caps, so they can be refilled easily. The middle tank holds a flammable, compressed gas (such as butane). This tank feeds gas through a pressure regulator to two connected tubes. One tube leads to the ignition system in the gun, which we'll discuss later on. The other tube leads to the two side fuel tanks, letting the compressed gas into the open area above the flammable liquid. The compressed gas applies a great deal of downward pressure on the fuel, driving it out of the tanks, through a connected hose, into a reservoir in the gun. The gun housing has a long rod running through it, with a valve plug on the end. A spring at the back of the gun pushes the rod forward, pressing the plug into a valve seat. This keeps the fuel from flowing out through the gun nozzle when the trigger lever is released. When the operator squeezes the trigger lever, it pulls the rod (and the attached plug) backward. With the valve open, the pressurized fuel can flow through the nozzle. A flamethrower like this one can shoot a fuel stream as far as 50 yards (46 meters). As it exits the nozzle, the fuel flows past the ignition system. Over the years, there have been a variety of ignition systems used in flamethrowers. One of the simpler systems was a coil of high-resistance wire. When electrical current passed through these wires, they released a lot of heat, warming the fuel to the combustion point. When the ignition valve is open, compressed flammable gas from the middle cylinder tank on the backpack flows through a long length of hose to the end of the gun. Here it is mixed with air and released through several small holes into the chamber in front of the nozzle. The gun also has two spark plugs positioned in front of the nozzle, which are powered by a portable battery. To prepare the gun, the operator opens the ignition valve and presses a button that activates the spark plug. This creates a small flame in front of the nozzle, which ignites the flowing fuel, creating the fire stream. 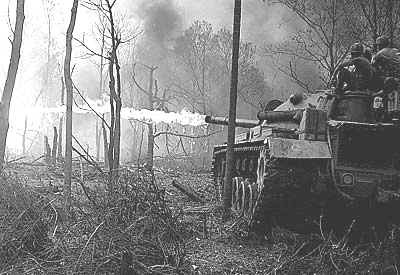 In World Wars I and II, as well as in the Vietnam war, similar flamethrower designs were mounted on tanks.